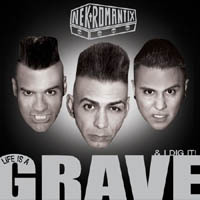 This is the first Nekromantix album since the Sandorff brothers left the band and Kim Nekroman started an attempt to conquer the States and make them kneel before the king of psychobilly. I can't say how the two replacement Nekros perform live but they do a fine job on this record. Kim's coffin bass sounds crispy and metallic and the guitar from TröyDeströy is great. On drums we now have Andy DeMize and he doesn't screw it up either. The sound on the album isn't too far from "Dead Girls Don't Cry" and that pleases my ears since I really liked that album. If you compare this record to some of the older records, I'm afraid that the older records will win the contest being more anarchistic and filled with funnier lyrics, but really this is a very cool record and musically it fits in perfectly next to "Dead Girls...". A final word: Please come back to Copenhagen soon and play a gig or two at Stengade 30. It's been way too long now. We are dying for some real psychobilly here. Is that too much to ask for? Horrorpops - Kiss Kiss Kill Kill ♦ Hola Ghost - The Man They Couldn't Hang ♦ Nekromantix - What Happens In Hell Stays In Hell! ♦ Hola Ghost - Chupacabra ♦ Nekromantix : "A Symphony of Wolf Tones & Ghost Notes"